Watkins & George featured in Craftseller magazine! Watkins & George is getting famous! Part of an interview I gave to the lovely Amy Hunt has been published in the November 2014 issue of Craftseller magazine. Craftseller is the UK’s fastest growing multi-craft magazine and the only monthly title for craft sellers. Launched in 2011, it’s packed with handmade, on-trend projects, real life success stories and tips on maximising profit. Thank you so much to Amy for giving me this great opportunity! The whole interview is below. Q: What are your most popular products? 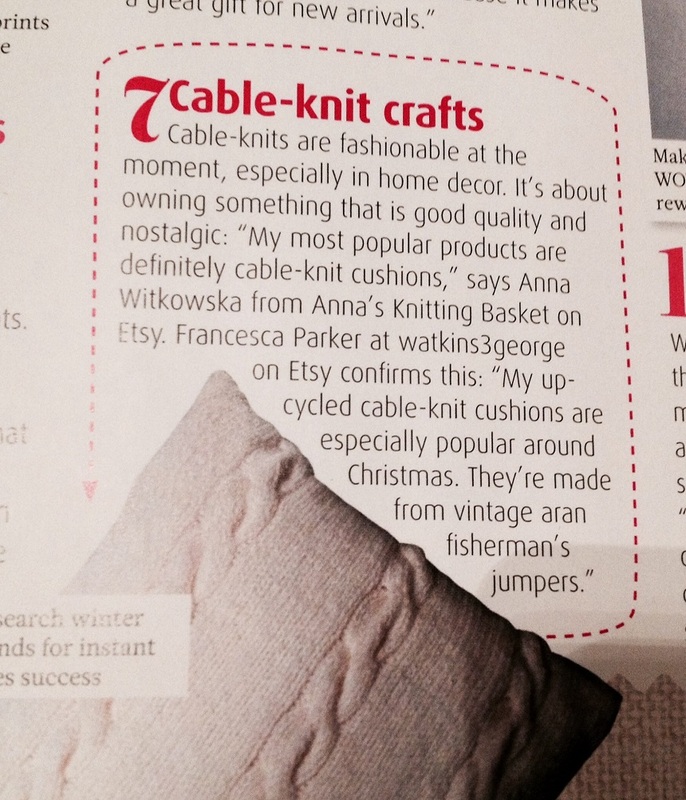 A: My “Hug me Hugh” up-cycled cable-knit cushions are especially popular around Christmas. I make them re-working vintage Aran fisherman jumpers into huggable cushions and soft toys. I have always admired the craftsmanship behind intricate cable-knit patterns and I love working on knits started by someone I don’t know. Quite literally, it’s like picking up the threads of someone else’s life! Q: Why do you think handmade items are gaining more popularity? A: Handmade items are absolutely unique, one of a kind. They establish a personal connection between the maker and the person who enjoys them. It is comforting to know that someone took the time to make something unique especially for us. As a costumer, I want to know where a product comes from, who made it and how. Handmade objects have a history that mass-produced high street items do not. They are 100% ethical as well. Q: How do you sell your items – online/ markets? A: I sell my items mostly online, in my Etsy shop. It’s a great way to reach a very wide audience and can be easily fit around work and family commitments. However, nothing beats direct contact with people who can touch and feel my knits. Christmas is the perfect time for markets and fairs, especially for those, like me, who make seasonal items. For the first time this season, I will be at the Truman Brewery Market in London’s Brick Lane in the run up to Christmas. Q: What will be really popular in your range this Christmas? A: My “Size Matters!” extra-chunky, oversize scarves and cowls are stylish and playful and I expect them to be a hit this Christmas, especially in bright, vivid colours. I source extra-bulky luxury yarn from a small family-run Finnish company and use 25mm knitting needles. I keep the designs very simple to make the material stand out. My extra-chunky scarves have an amazing texture: people cannot stop touching them! Q: Do you take commissions? If so, what are customers asking for? A: Yes I do take commissions. All my items are one of a kind and I am happy to personalize them to make them extra-special. In some cases customers ask for small tweaks to a product they like, such as different buttons. In other cases they ask for something they cannot find in the shop and it is fun to design something new together. Q: How long do you take to make items roughly, and what do you charge roughly? A: Finding the right balance between high-quality, unique products and affordable prices is the greatest challenge when developing new designs. Personally, I believe that handmade is about quality and I am fierce about the quality of the materials I use. Of course, insisting on high-quality materials means higher costs. Keeping my designs simple is also a way to keep reasonable prices.